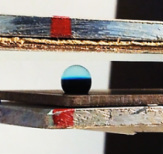 Production of a single aqueous droplet in oil using surface acoustic waves (the black arcs are the electrodes which generate these waves in a piezoelectric substrate). Particle and cell handling techniques represent one of the major microfluidic building blocks required for the development of lab-on-a-chip (LOC) devices. Manipulation techniques can be used for concentration of samples, accurate location of particulate matter and separation of differing particulate populations in a mixed suspension. We predominately examine manipulation methods using vibration. At high, ultrasonic, frequencies we exploit acoustic radiation forces in new ways, at low, subultrasonic, frequencies we are developing the use of inertial methods. Separation of two particle populations based on size using ultrasonic excitation. Personalized health monitoring and recent advances in micro-electromechanical systems (MEMS) have attracted a significant attention to miniaturized sensors. In order to communicate with remote sensors (for example in the body) wireless technology frequently makes use of inductive coils. We have investigated using such inductive coils as a pressure sensor by studying the detectability and scaling laws for the inductance change when the gap between two such coils is altered. Findings suggest that the sensitivity could match that of a more conventional capacitive system with good scaling behaviour. A schematic of a two layer spiral inductor fabricated by a multistep process developed and implemented in the Melbourne Centre for Nanofabrication. Cell lysis is a key sample preparation stage in many biomedical studies as DNA extraction and classification require the use of the nucleic acid and proteins released upon decomposition of a cell membrane. 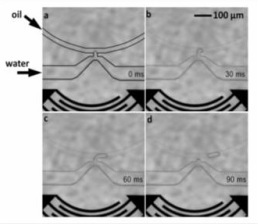 We present an effective method of lysing cells suspended in a microliter droplet placed on a super-hydrophobic surface. When a bubble, injected into the sessile droplet, subsequently ruptures, a rapidly moving fluid jet is formed. 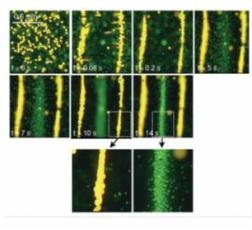 In this work, cells that are transported within this fluid jet are captured on a separate hydrophilic substrate and are shown to have been lysed. The jetting mechanism occurs when the thin film at the apex of the drop/bubble system ruptures at the recipient surface as it comes into contact.